Hidilyn Diaz is a Filipina Silver Medalist winner in the recent Olympic competition she participated in the 2016 Summer Olympic Games in Rio de Janeiro, Brazil. She won 2nd place or the silver medal award in women's 53kg weightlifting category, it was the 3rd silver medal won by a Filipino athlete in Olympic History and the 1st medal to win after 20 years of waiting since a silver medal won by Mansueto “Onyok” Velasco in Men's light flyweight boxing Gold medal bout in 2006 Summer Olympics. The 25 year old Diaz, who came from Zamboanga City, is the fifth child of Eduardo and Emelita Diaz. Her weightlifting career started after her cousin Allen Jayfrus Diaz, introduce to her the basic of weightlifting. She was also in military career as a airwoman in Air Force, she then was recently promoted to Airwoman Second Class after bringing honor to the country. Hidilyn Diaz, started her Olympic career in 2008 Summer Olympics, competing in the women's 58-kg class at age 17, despite not winning any medal she was praised and considered promising at her young age. In 2012 London Summer Olympics, Diaz once again competed in in the women's weightlifting under 58 kg, the first Filipina to participate in two consecutive summer Olympics. And in 2016 Rio Summer Olympics, her 3rd consecutive Olympic participation she finally get the most awaited medal that she deserved. after all the sacrifices and hardworking she finally won the silver medal to give honor to the Philippines as the only and current medal in 2016 Rio Olympics. Despite winning the silver medal Diaz, admitted that she was just only aiming for the bronze medal award but luckily won more than what she expect. Diaz, received a ₱5M check from the Philippine government as an incentive, an amount given for athletes that won Olympic medal. Aside from the government incentive she also received ₱2M, from the president itself, handed by Pres. Duterte after Hidilyn Diaz, gives a courtesy call to Pres. Duterte in Davao City. The additional reward was an extra amount to encourage all athlete to give their best and after their hard training and sacrifice a reward awaits them. 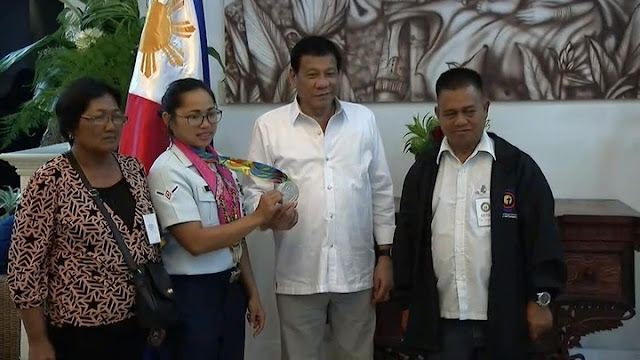 No Comment to " Hidilyn Diaz the Woman behind the Silver Medal Award in 2016 Rio Summer Olympics "